Hardcover available for just $10 more! You will not see this offer again, so if you are interested, you MUST act now. outline maps of the world available anywhere today. Now you can have hundreds of historical outline maps at your finger tips. Save yourself countless hours scouring the internet for the perfect printable map for your history lesson! Recommended by The Well-Trained Mind! It is a proven fact that using historical outline maps help cement historical and geographical facts for students and adults alike. Just knowing that Alexander the Great conquered the whole known world is simply not enough. Seeing this enormous ancient empire on paper gives visual and non-visual students an edge in their learning. The truth is... most educators know this, but struggle to find the printable maps they are looking for. Now your search is over. 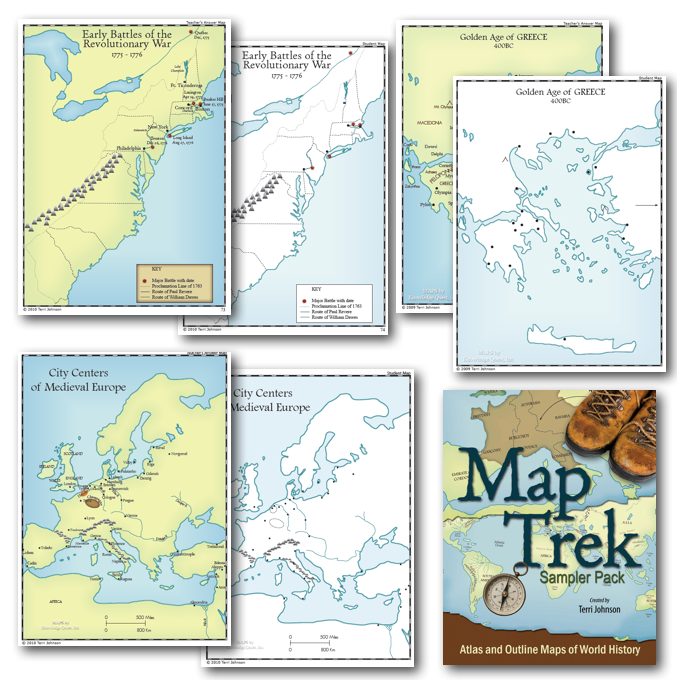 Finally, Map Trek Historical Atlas and Outline Maps is now available as a set of six (6) beautiful full-color e-books for easy printing. 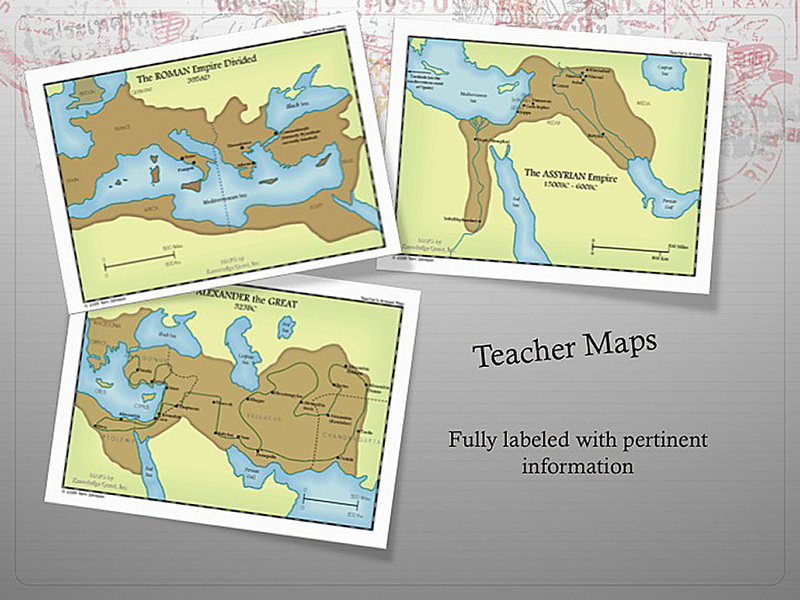 Have over 465 World History Maps at your fingertips. Print them all or just the ones you need today. Never worry about lesson plans for your historical outline maps. We've included them for you! Have different aged students working at their own ability. No more trying to stretch the lesson up or down. See the landscape (i.e. the political boundaries, major cities, etc.) from the historical time period - instead of what the region is like today. Label places of historical significance on their outline maps. Color in empires, trace travel routes, draw scales and directional symbols, etc. Finished maps can be posted to the bulletin board or refrigerator or placed in a history notebook. You may be wondering if you can find most of these printable maps for free online? The truth is, quite frankly, that you will not. I used to spend countless hours scouring the Internet for the appropriate map for our history lesson. Sometimes BINGO I would find just what I was looking for. But more often than not, there would be something about the map that I wished I could change. Maybe we were studying the United Kingdoms of Italy and the boundaries of the territories were not there. Or maybe we were studying South America during the times of the Spanish conquistadors and the only maps I could find had current political boundaries or no boundaries at all. I began producing these printable maps in 2001 for Susan Wise Bauer's Story of the World series. Since then, we have greatly improved the quality of the maps using vector graphics and full color. These new upgraded computer generated maps are cleaner, clearer and easier to use than the original ones. India Under Rule of British Easy India Co.
9/11 - Attack on the U.S.
Two of each map topic is included - one for the teacher and one for the student. Print as many maps as you need for your family with this set (group licenses available). Also included are complete lesson plans for students in grades 1-12. End the search for maps on the Internet for good. Now you can have every world and U.S. maps that you need right at your fingertips. You'll get access to all of these maps just minutes after you click the "Add to Cart" button. 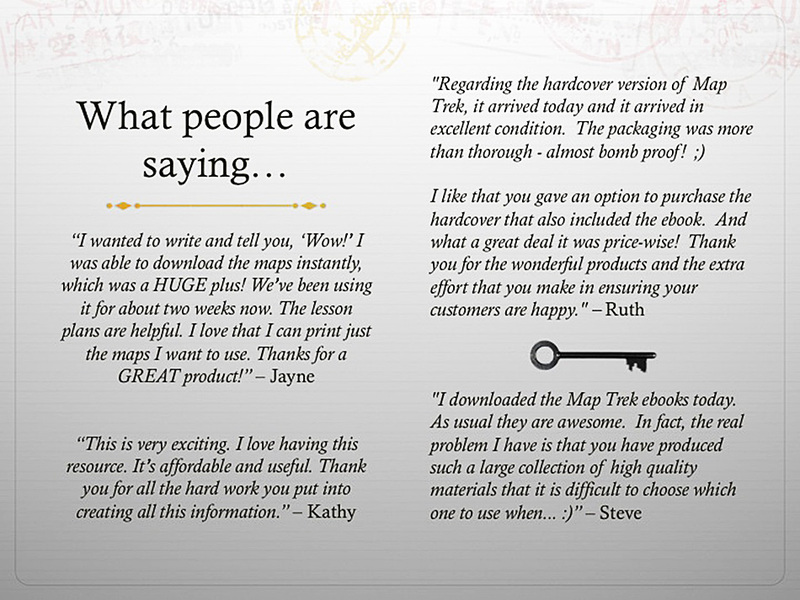 30 Day Money-Back Guarantee: I'm so confident that Map Trek is the map solution that you are looking for, that if you do not LOVE the ease and convenience of Map Trek within the first month of using it, just send me an email and I'll refund the full purchase price back to you... no questions and no hassles. You've wasted enough of your time and energy trying to find the most useful maps online. The GOOD NEWS is that you have finally found them. Think about it... The next time you need a map to show where an even in history took place or for a mapping activity, you can just pull out your Map Trek book, click print and you are ready to go. Grab your copy of Map Trek at this ONE TIME ONLY price by clicking the "Add to Cart" button now and you'll be trekking with your students throughout history starting today.